"In this society today, sometimes it's hard to make regular meals, healthy meals, a part of everyone's existence...And this is one of the reasons why I'm so supportive of farmers' markets. For those of us who are battling the time crunch and those of us [to] whom access to fresh food is an issue in our neighborhoods, farmers' markets are a really important, valuable resource that we have to support." 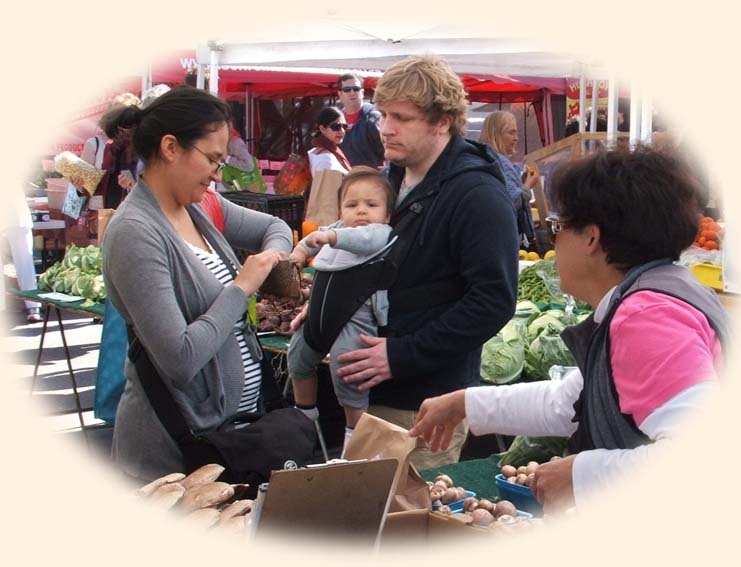 Alameda Farmers' Marke has locally grown produce, kid-friendly activities and more. The Ecology Center Farmers' Markets accept EBT, WIC. and Senior Nutrition coupons. Solano Avenue at San Pablo Ave.
Would you like to volunteer at the Freedom Farm Stand? Call Farms to Grow at (510) 379-8600. Each week Oakland Fresh School Produce Markets are held after school, on school sites. Parents, children and volunteers sell fresh, pesticide-free produce, honey, eggs and other food items that are bought from local farmers. Nutrition info and recipes are available. There are tastings and periodic cooking demos as well. Oakland Fresh School Produce Markets are open to the public. EBT is accepted. There is also a Oakland Fresh Market-to-Classroom Lesson Toolkit available for teachers via Oakland Farms-to-Schools Network. The food gathered when visiting school's farmer's markets, can be used when teaching science, math and language arts concepts. Phat Beets has a handful of farmers market sites that sell fresh produce. Phat Beets accepts EBT/SNAP/Food Stamps and WIC. Saturdays 10 a.m. - 3 p.m. If you receive SNAP, (Supplemental Nutrition Assistance Program), benefits, check out your local farmers' markets. Many farmers' markets now accept SNAP/CalFresh. If you are a Farmers' Market Director or Manager that would like to accept SNAP benefits, follow the first link below to apply for authorization. The second link is a how-to handbook on accepting SNAP benefits at farmers' markets. WIC Farmers’ Market Nutrition Program (FMNP) ensures WIC participants are able to purchase fresh vegetables, fruits and herbs at farmers' markets. Infants 4 months and up, children until age 5 and women are eligible for the FMNP. There is also a program for low income seniors called the Seniors Farmers' Market Nutrition Program, SFMNP. Follow the link below for further information on SFMNP.